I’ve been in the industry for a few years now and I can tell you the Holiday season can be a little slower for antique dealers/pickers. Sad to say, but I’ve heard many dealers say they have a hard time paying rent during the Holidays, much less making a profit for the work! I try to be very strategic when it comes to Classic Cottage Co. during the Holidays so that I not only make rent but bring home a paycheck! Here’s a few tips! People are buying all things Christmas right now. Look at the big box stores – Target can barely keep it in stock. Wednesday I had a good day at my largest booth location and most of the items that sold were CHRISTMAS! If it’s out (& priced right) I’ll sell something Christmas-y just about every day this time of year. Yep, that Christmas decor serves another purpose too. It makes the booth feel festive which in return makes people happy which leads to jolly ol’ buyers! Tip – All the Christmas decor does have a price tag! Style those Christmas decorations in your booth as you would your home. This not only keeps the booth looking pretty but shows buyers how to use your merchandise. I shop all year long for Christmas items so I’ll be fully stocked all season. Sure, everyone has Christmas on the brain. Sure, everyone is spending all their money on Christmas gifts. Use this to your advantage!!!! Those same shoppers are making a mental Christmas wishlist as they shop. I’ve seen wives spot a vanity or buffet and the husband show up the next day with a cash in hand. 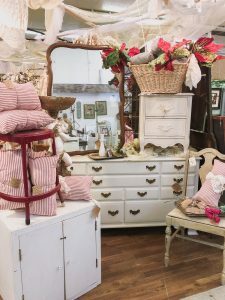 Now is the time to bring out those beautiful pieces that that would make for the perfect Christmas gift.